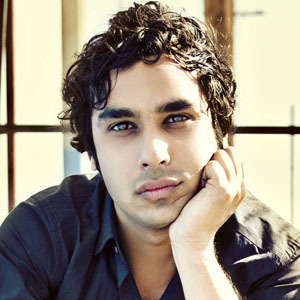 Kunal Nayyar, who is best known for his role as the loveable and dorky astrophysicist Rajesh Koothrappali on the hit CBS sitcom The Big Bang Theory, has a career that spans television, film and the stage, and, in 2015, he added author to that list when he published his memoir, Yes, My Accent Is Real: and Some Other Things I Haven’t Told You. acting at Temple University in Philadelphia. If what you want happens, good. If it doesn’t happen, very good. After graduating, Nayyar acted in a few commercials and briefly took the stage in Love’s Labour’s Lost in London. He first gained attention in the U.S. for his role in the Los Angeles production of Rajiv Joseph’s 2006 play Huck & Holden, for which he won a Garland Award for Best Male Lead in a Play on the West Coast. That same year, Nayyar teamed up with Arun Das to write the play Cotton Candy, which premiered in New Delhi to rave reviews, before returning to Hollywood where he made his primetime television debut with a guest role on NCIS. Nayyar’s agent encouraged him to audition for the role of a scientist in an upcoming CBS pilot. He was cast as Rajesh Koothrappali in The Big Bang Theory, the highest-rated sitcom since Friends signed off in 2004. The role quickly made him a household name and according to Forbes he was the third highest paid TV actor in 2015 and the sixth highest paid TV actor in 2017. The show, currently wrapping up its 12th and final season, and its cast has earned many awards and nominations including winning the People’s Choice Award for Favourite Network TV Comedy and Favourite TV Show multiple times and being nominated for a Screen Actors Guild Award for Outstanding Performance by an Ensemble in a Comedy Series five years in a row. It ranked as the season’s most-watched series, for the 2017-18 season, marking the first time a comedy has been the #1 show since Friends in 2002 and the first CBS comedy to win since All In The Family in 1976. Besides playing Raj on The Big Bang Theory, Nayyar has lent his voice to the animated series Sanjay and Craig, the 2012 film Ice Age: Continental Drift, and DreamWork’s 2016 animated movie Trolls. A devoted cricket fan, Nayyar produced and narrated the 2013 documentary Beyond All Boundaries. In 2014, he appeared in his first film, Dr. Cabbie, produced by Bollywood’s Salman Khan and in the thriller The Scribbler. He revisited the stage briefly in 2015, performing in The Spoils, an off-Broadway production written by and starring actor Jesse Eisenberg. Too often we focus on the greater schemes in life, like making money, or getting promoted at work, or starting a new relationship – and yea, of course, those things matter – but sometimes it’s the tiny, gradual, stepping-stone victories that bring real joy and signify the positive changes in our life. In 2015, Nayyar published Yes, My Accent is Real: and Some Other Things I Haven’t Told You, a revealing collection of humorous essays tracing his journey from a little boy in New Delhi who mistakes an awkward first kiss for a sacred commitment to the confident, successful actor on the set of a hit TV show. Nayyar currently lives in Los Angeles with his wife, former Miss India Neha Kapur, and their rescue dog, Boba Fett. He has started scholarships at the University of Portland and at Temple University to give back to those who helped him get where he is. As he prepares to say goodbye to Rajesh Koothrappali, Nayyar told US Weekly it would be nice to do something different – maybe a drama. Kunal Nayyar was part of The ANOKHI Prestige List 2012.